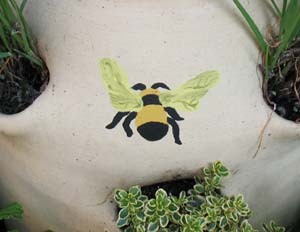 Bring an air of whimsy to your garden by painting a bee stencil on a planter. With a variety of Summer stencils you can invite the warmth and sunshine into your world year round! 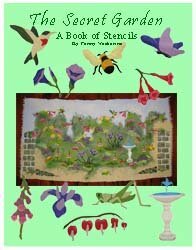 The bee and many other garden stencils can be found in a book available below. I know that as a crafter you most likely have many interests. If one of your other interests is gardening, have you ever thought about lending some of your artistic stenciling techniques to your plants? It’s a great way to spruce up an old terra-cotta pot but you may get so enthused by the idea that you will find yourself out buying more pots. Here’s what I did with an old strawberry planter. I know once you read this you’ll have many other ideas. I decided to adorn this old strawberry pot with a small bee stencil. I was looking for something that was a subtle surprise in my peaceful herb garden and he was a perfect match for my plan. It was really quite easy. The only challenge of painting on a planter is that they are usually round and taping your stencil in place to get a good solid paint line becomes a little more difficult than on a nice flat surface. If you work with a paper stencil or a very flexible material like vellum or Mylar, the stencil will fold easily over the curve but some of the stencil outlines (or islands) will stick up. Here is where the stippling technique is essential. You need to use your stenciling tool (brush or sponge) to come down right over the edges of the stencil and gently push them to the surface of your pot. It’s an easy straight up and down motion. And as always make sure your brush is on the dry side. Too much paint will seep under the edge of the stencil and smear. For more on the basic techniques of stenciling visit How To Stencil. There you’ll find out more about the stippling technique and ways to keep paint from smearing under the stencil. Of course if you are using a thick plastic stencil you will have more of a challenge getting it to lay flat around the curve of the pot. You might want to try to increase the tape or use a heavier tape. Just be very careful because pots do break. Also, make sure that your pot is very clean and free of dirt of course. You can imagine what will happen if you paint over smudged dirt – the paint won’t last long! I have a confession: I actually painted this pot with the plants still in it. Well, I loved the pot and these chives had been growing so beautifully for a long time. I didn’t want to disturb them, so I thoroughly cleaned the spot where I wanted to paint. Here is a close up of the painting. As you can see, he’s just a little bee that has settled on the pot. A simple adornment. If you want more bugs for your garden then don't miss the Butterfly Stencils that will flutter a little color into your painting. And of course if you love the idea of combining several hobbies look up the Stamping and Stenciling Gardening Project where you'll see more of the bee stencil. I hope you liked the Bee Stencil Strawberry Planter. If you did, check out the books of stencils below (you’ll find the bee stencil in the first book). 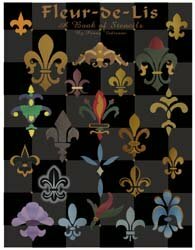 This is just a sample of the downloadable and printable Stencil Designs we have to offer. Each book will come to you as a down-loadable pdf file in your e-mail. Just check your e-mail after purchase for the link to connect to your file and print or save. It's that easy! Click on any book image for project ideas. Create your own private garden retreat. This collection includes 12 designs-fountain, bleeding heart, iris, a bee stencil, butterfly, foxglove, grasshopper, hummingbird, trumpet flower, morning glory, stone wall and stone path. Here are a few more friends for you to invite into your garden theme! 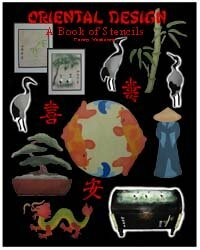 This collection includes 16 designs- Chinese Dragon, Bamboo, Oriental Figure with Coolie Hat, Yin Yang Koi, Bonsai Tree and 3 Cranes plus 10 Chinese Symbols (Eternity, Friendship, Happiness, Harmony, Long Life, Peace, Prosperity, Tranquility, Truth and Dragon. 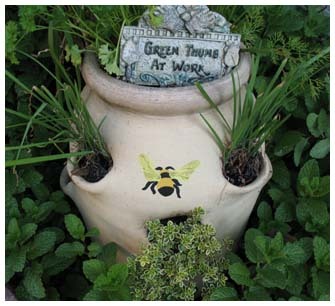 You’ll have fun creating and showing off this wonderful Bee Stencil Planter. This project should get you thinking about all of the possibilities for designing art for your home. 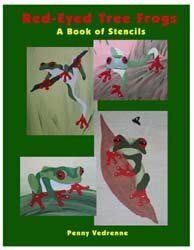 I hope you are inspired to create some great works of art with stencils! And check out some of the many free printable stencils listed in the column on the right! The designs used as samples on this site are courtesy of Designs From Penny. Would you like to build a web site like this one and turn a passion into a business? Well, if I did it, you can too. Don't think that you have to be a web designer and know all about computer codes and complicated html stuff. I didn't. With Solo Build It! it's easy and they have the tools in place to help you build pages and teach you how to create a successful web site. Want more information? Just click on Powered by Solo Build It! here and watch a cool video that will explain everything. I know you'll get excited like I did. Return to Home Page from Bee Stencil Planter Project. Return to Stenciling Ideas from Bee Stencil Planter Project.